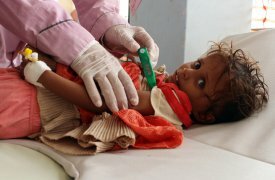 Confronting this catastrophe commands honesty: Cholera is now rampant not only in Yemen, but South Sudan, Ethiopia, Kenya, Somalia, Sudan, and in refugee camps across the Middle East. Last month, the disease broke out in a luxury hotel in Nairobi, sickening attendees to a health conference. By that time, UNICEF head Anthony Lake said, the #Yemen disaster was growing by 5,000 new cases per day—a pace it has since well exceeded. The true toll may well reach half a million before July ends, and the agony is evident everywhere one looks. The horrible irony is that cholera is spreading primarily because Saudi Arabia and its Gulf state allies have been bombing Yemen’s infrastructure to smithereens for months, rendering every water supply contaminated. The reluctance of Ethiopia and other cholera-afflicted nations to truthfully state their health plights is due to the same countries’—Saudi Arabia and its Gulf allies—policies of boycotting all trade and food from nations that admit to having the disease. And historically the greatest scourge of the annual Hajj is—you guessed it—cholera.